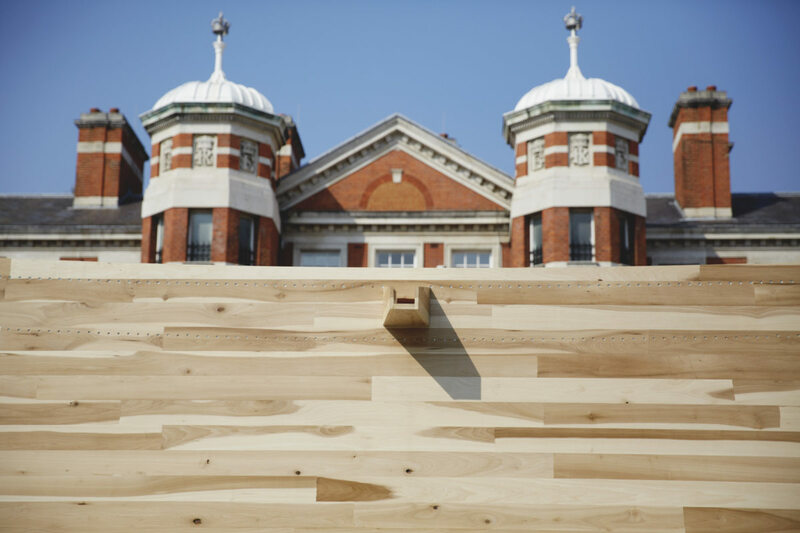 ‘The Smile’ was a hugely successful Landmark Project for the 2016 London Design Festival; a public pavilion in the Chelsea College of Art (UAL) Parade ground that showcased the structural and spatial potential of cross–laminated hardwood using American tulipwood. This extraordinary building, designed by Alison Brooks Architects with engineering by Arup, straddled architecture, sculpture, and public art. It could be described as an unidentified flying object: a 34m long, 3m high upside down arc poised on the urban horizon. 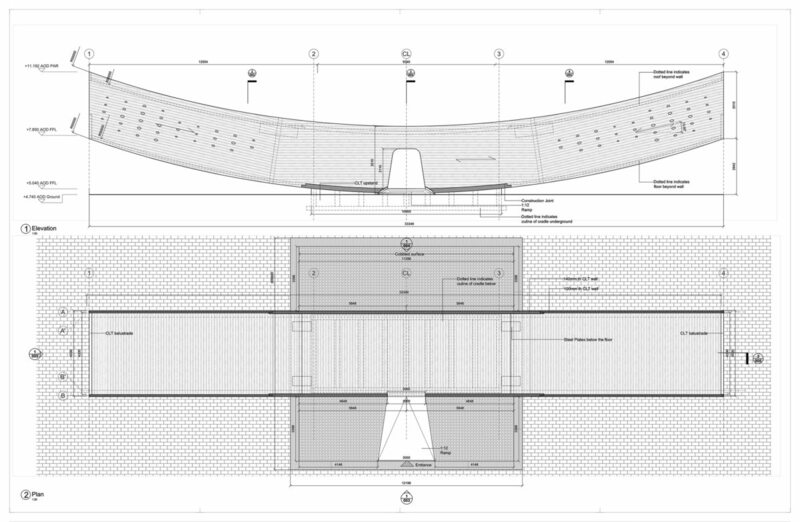 It was a doubly cantilevered, four sided tube that curved upward to its two open ends, allowing light to wash across its interior surfaces like water across a spillway. Hovering 3m above the ground, its two ends acted as viewing platforms taking in the sky and neighbouring Edwardian buildings. Entering The Smile through an opening where the curved form meets the ground, the visitor could walk (or run!) 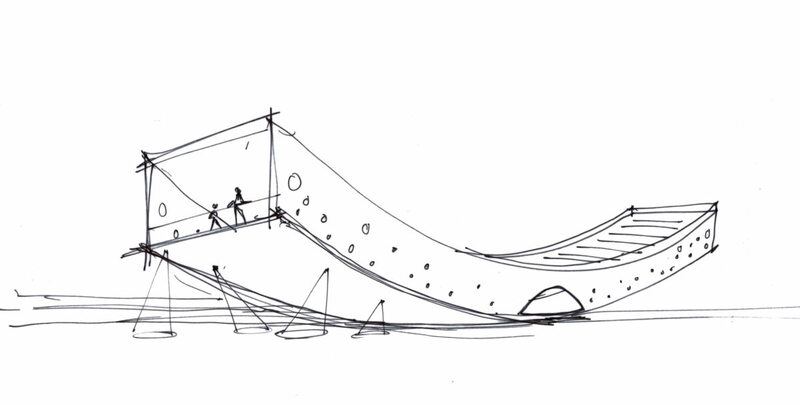 from end to end of the 34-metre-long tube discovering a dynamically curved space that gradually rises toward light. A segment of a 100m diameter circle, the Smile created an immersive sensory environment integrating structure, surface, space and light. 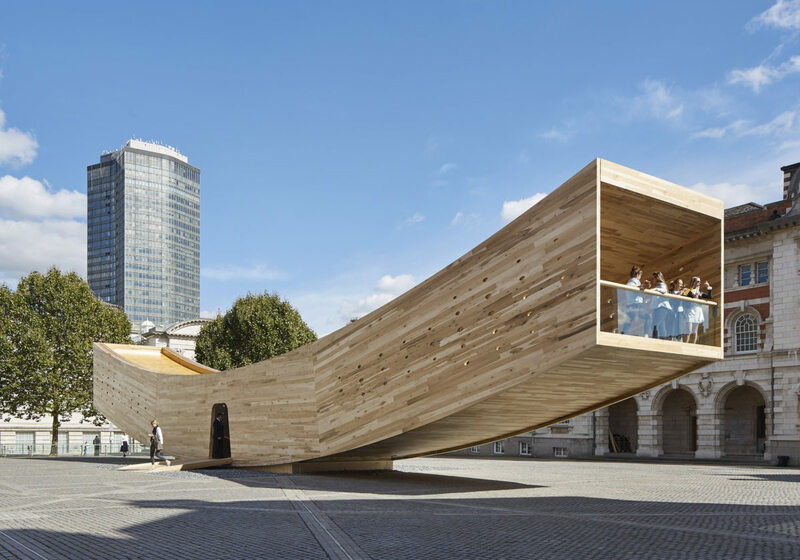 The Smile was prefabricated as 12 industrial-sized tulipwood CLT panels manufactured by German CLT pioneers, Züblin-Timber in Germany. Up to 14m long and 4.5m wide, these were the largest ever to make it into production. ABA introduced perforations in the walls — concentrating where there is less stress on the structure and dispersing where the timber is working harder — to create a form of structural ornament, bringing dappled sunlight to the interior. At night, when the interior is lit up, the pavilion turns into a giant lantern. Arup applied their latest timber research to devise a structural connection system of 4000 screws over a foot long that can be installed with an ordinary rechargeable screwdriver. At the tube’s mid-span four 1m long steel plates connected the main structural panels at high level, also using screws. 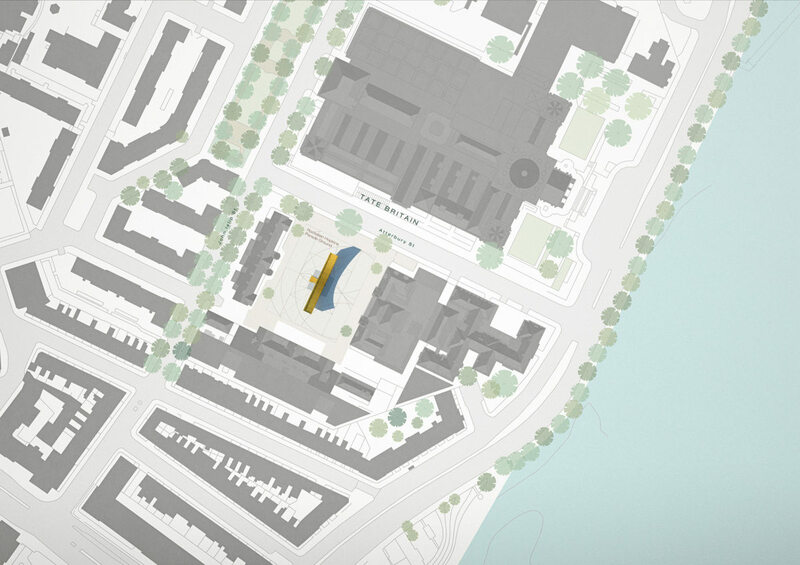 A condition of the pavilion taking its place in the Chelsea Parade Ground was that no foundations were possible – the structure had to be self-supporting. The solution was to connect the structure to a 1m deep glulam timber cradle filled with 20 tonnes of steel counterweights. Inches below the cradle are the remains of the 19th-century Millbank prison, once a transit station for convicts before they were deported to Australia. 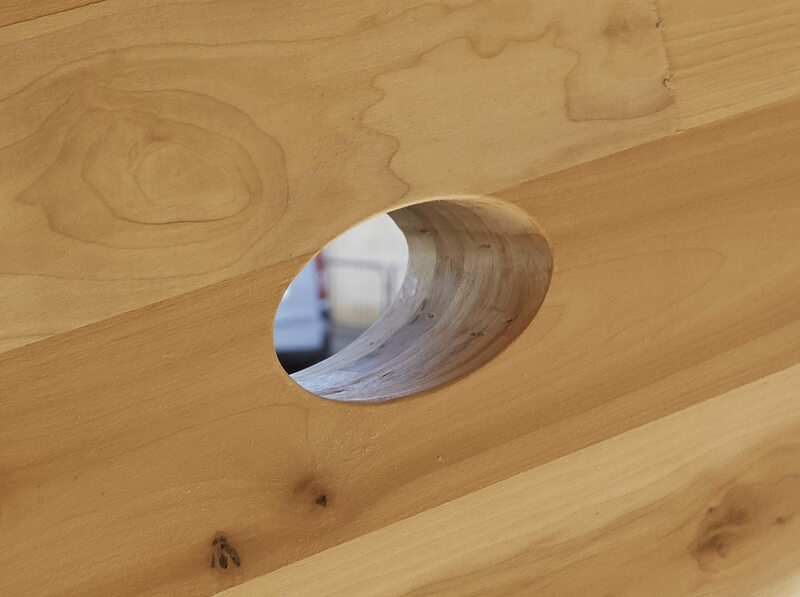 For AHEC, The Smile is one of the most important developments in a decade of research into structural timber innovation with structural engineers, Arup. For Alison Brooks Architects the installation was an opportunity to free architecture from the conventions of permanent building, to celebrate the sensory qualities of wood, and the chance to stretch a fully renewable, zero-carbon structural material to its limit. The Smile consisted of around 70 cubic meters of tulipwood and 25 cubic meters of spruce, altogether stores 70 tonnes CO2 eq. Just takes less than five minutes for tulipwood required to be replaced in forest. 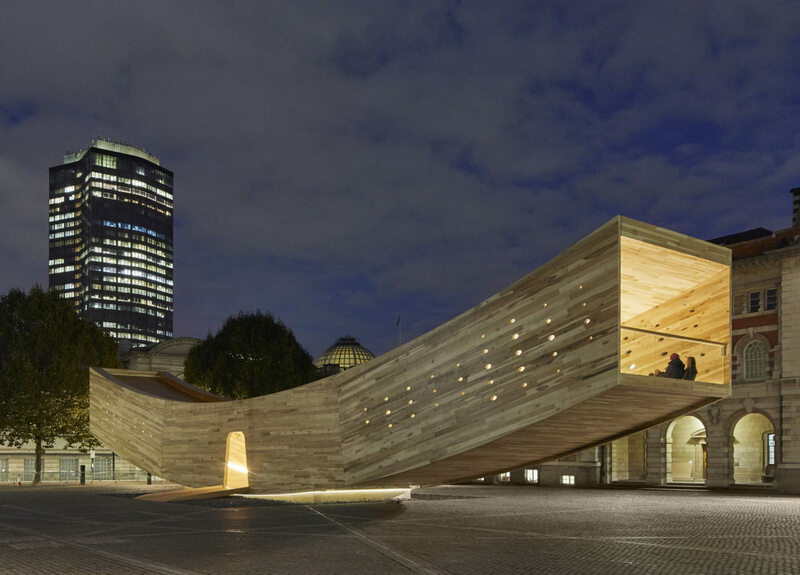 Supported by the American Hardwood Export Council, London Design Festival, Arup, Züblin-Timber, Seam, Atrium, in partnership with the University of the Arts London. The Plan – Did you say “wood”?